A very short bottled history of France, ancient and new. And "The Yellow Vests". 'Almost six out of ten self-professed “yellow vests” in France believe that Diana, Princess of Wales, was assassinated, according to a new study suggesting the movement is steeped in conspiracy theories. The astonishingly high figure among yellow vests was part of a study looking at ten conspiracy theories widely circulated on social media since the start of the movement in mid-November. It found that 40 per cent of ”gilets jaunes” believed in at least half of the theories. In most cases, they were more than twice as likely to believe a theory than the national average. By comparison, some 34 per cent of the general population said they believe that Diana’s death in a car accident under Paris’ pont de l’Alma in August 1997 was a “masked murder”, according to the Ifop study. That tallies roughly with a 2013 YouGov poll in the UK, which put the figure at 38 per cent. 6 out 10 see through the lies and cover ups of the elite and protesting to demand change from their own government. Don't be surprised if the establishment media claims that the leaders of yellow vest are ISIS affiliated. I would not be surprised, as Macron has already tried the "Russia is behind it..." lie. 'Emmanuel Macron’s closest special adviser has become the latest to quit the Élysée Palace as the French president reshuffles his team to counter the gilets jaunes anti-government protests and an ongoing scandal around a former security aide. The president is now making changes to his inner-circle. Macron’s young team has been accused of being caught off guard when the gilets jaunes (yellow vest) fuel tax revolt began in November and quickly morphed into a widespread protest against the executive. This close-knit group of mainly young, male advisers, dubbed “The Mormons”, were seen as clever at digital messaging and strategy but distant from on-the-ground politics. Emelien said he would leave in late March because he wanted to take a more public role and promote a book about progressive politics. 'Thousands of yellow vest protesters took to the streets across France on Saturday for a 15th straight weekend of demonstrations, trying to re-energize supporters while stamping down on the violence and anti-Semitism in the movement's ranks. Tempers frayed at the end of the main demonstration at the Trocadero plaza, next to the Eiffel Tower, and French police used tear gas to disperse protesters. Five separate demonstrations were organized in the French capital, which saw 4,000 protesters by 2 p.m. according to Interior Ministry, which said there were 11,600 protesters scattered across France. Support for the movement has ebbed in recent weeks as it has splintered and outbreaks of violence continue. The horrid moment when a man was hit in the face during Yellow Vest rallies in Paris was caught on camera, with witnesses saying the projectile was fired from a riot gun – a controversial weapon used by the French police. The video, apparently captured using a mobile phone camera, shows protesters trying to evade projectiles being fired by police near the iconic Arc de Triomphe. Seconds later, a man can be seen lying on the ground as first responders rush to help him. It is unclear whether the injury was life threatening. Witnesses said the victim was hit by a so-called defensive bullet launcher, a weapon blamed for dozens of injuries to anti-government Yellow Vest protesters in recent weeks, according to RT France. 'Hundreds of 'pink vests' joined those in traditional yellow for marches in Paris on Saturday, marking the 17th straight weekend of anti-government demonstrations despite attempts by French President Emmanuel Macron to quell discontent with a nationwide series of debates. Protesters wearing the neon high-visibility vests that have come to symbolise the movement were joined by others donning pink tops, as childcare workers turned out against a reform of their unemployment subsidies. 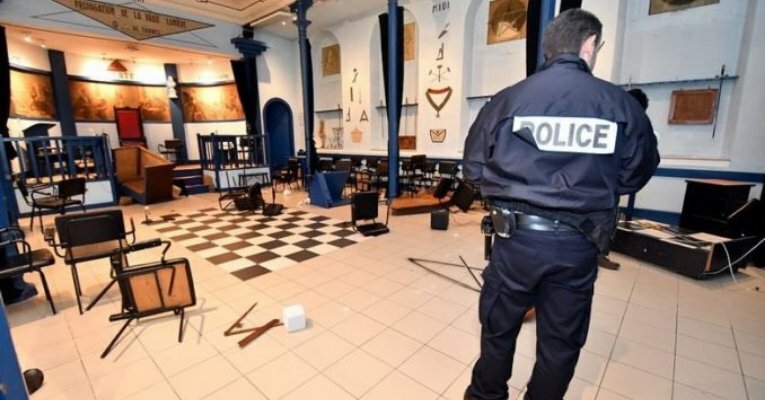 Other gatherings were planned on Saturday in several French cities such as Bordeaux and Toulouse as well as smaller towns such as southerly Puy-en-Velay. Some demonstrators staged a 'flashmob' at Paris' Charles de Gaulle airport, waving French flags and dancing in one of the terminals, television footage on BFM TV showed. What started out last November as a backlash against Macron's plan to hike fuel taxes - part of his bid to push a cleaner energy model - has morphed into a broader movement decrying the government as out of touch with the hardships faced by some households and low-income workers. Turnout has dwindled since nearly 300,000 people took part in road blockades and marches across France on Nov. 17, coming in at 46,600 last Saturday according to the interior ministry. This week, hundreds of protesters joined the 17th week of Yellow Vest demonstrations in the French village of Tarbes, as tens of thousands more marched throughout the country. During the demonstrations in Tarbes, a group of protesters began shouting that they were planning to march on a nearby Masonic temple. A crowd of protesters used a battering ram to break through the heavy door of the lodge, as others pelted rocks at the building. Protesters destroyed everything in sight, overturning furniture and destroying expensive art after breaking into the building. Is this Grand Orient of France ? It made me laugh that politicians rushed to defend the Masons. I have never seen this in my lifetime. Could this be a false flag though? Would the masons allow defacing and vandalism of their precious idols and symbols in order to turn it around on the protestors? I've never heard of anything like that ever happening. Me neither. Although many rulers forbade this secret society and many freemasons have been persecuted. However, the question is whether the "Yellow West" was done it by incident, in rage or did it intentionally, with some purpose? Mostly just stuff on the floor. French Prime Minister Edouard Philippe said Paris could soon ban protests in “worst hit” neighborhoods, after radical protesters turned a Yellow Vests’ demonstration on Champs-Elysees into smashing, looting, and burning mayhem. "From next Saturday, we will ban 'yellow vest' protests in neighbourhoods that have been the worst hit as soon as we see sign of the presence of radical groups and their intent to cause damage," Philippe told reporters on Monday. Earlier on Monday, it emerged that future protests and demonstrations could be banned in the heart of Paris after French President Emmanuel Macron consulted with his interior and justice ministers during an emergency meeting. Re: A very short bottled history of France, ancient and new. And "The Yellow Vests". How much will the French government use the shooting in New Zealand to justify disrupting the online communications of protectors. I would not be surprised if the French government uses technology to make phones/computers of protestor's inoperable and those that agree with the cause. 'French soldiers will be deployed Saturday to help guard public buildings, allowing police to focus on dealing with "yellow vest" demonstrators in case of renewed violence in Paris and other cities, the government said Wednesday. The troops will be redeployed from the "Sentinelle" anti-terror operation, which patrols streets and protects airports, train stations, places of worship and other sites, government spokesman Benjamin Griveaux told reporters. This will allow police forces to "concentrate on crowd control, along with maintaining law and order," he said. Last Saturday, more than 5,000 police officers failed to stop hundreds of violent protesters from rampaging along the Champs-Elysees, burning and looting over 100 businesses in a rampage that lasted more than seven hours. After the rioting, the government sacked Paris police chief Michel Delpuech. Two other top police officials, including one of Delpuech's aides, will also be removed from their positions, government sources told AFP. 'French soldiers will be permitted to 'open fire' if lives are threatened by Yellow Vest rioters this weekend, the military governor of Paris said today. General Bruno Leray's ominous words highlight the growing law and order crisis faced by President Emmanuel Macron as he faces up to the increasingly violent social movement. General Leray told Franceinfo Radio on Friday: 'If their life or that of the people they defend is threatened, they can go up to opening fire.' There was widespread rioting across the French capital last Saturday, with banks, high-end shops, and restaurants looted and burnt out.